it's really hard to believe that we're just a month away from our holiday dance show. time is whizzing by so quickly. here are two pictures that our dance studio director snapped on her phone recently. the first is from an early morning saturday ballet class when we were working at the barre, and the second is from our little halloween celebration between classes. 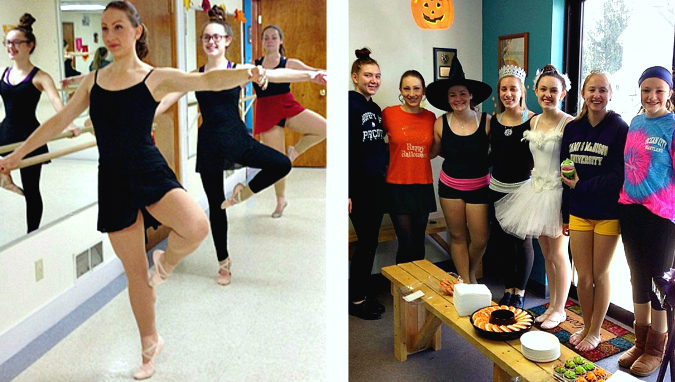 it's a bit hard to dance in class in full halloween costume, so the junior/senior girls just wore a few costume accessories (except for one of our girls who actually came in a full white swan ballet costume from swan lake, it was pretty cute). in other news, leko is pretty excited that halloween and trick-or-treat are both now over, and that i'm no longer wearing that gold wig! Ah, a ballet class...What could be more perfect! Looks like all the girls had fun.